This topic contains 7 replies, has 6 voices, and was last updated by bjnorris 2 months ago. Has any Shed yet managed to install an all singing, all dancing solution to the removal of dust from the workshop? I ask, because although we have installed individual suction points to each machine dumping to a portable industrial dust extractor, it is still not sufficient to remove airborne dust particularly from the belt sander and mitre saws which produce a lot which causes problems and means that those with breathing difficulties cannot take part in these activities. I suppose the question is, has any Shed built a solution which works and avoids having to drill an extraction point through the external wall (we are prevented from doing so under the terms of our occupancy)? we open the front door and the rear door and let nature that its course.? But that’s hardly a practical solution. Dust is a serious health issue that Sheds ignore at their peril. If you have an opening window, you could make up a board which fits/clamps in the window space and carries the extract pipe. Then you can remove it at the end of a session and close the window. We are currently working on that issue. After researching and taking advice from different retailers, We hope that we have come up with a decent solution to this issue. First we have purchased a 3hp 16amp twin Chip & dust extractor that we will be routing to all machinery using 100mm clear pipe. Each unit will be fitted with their individual blast gate. We hope to restrict the need to reduce the pipe size to machines where possible.We will need to make attachments / hoods for certain machines e.g. 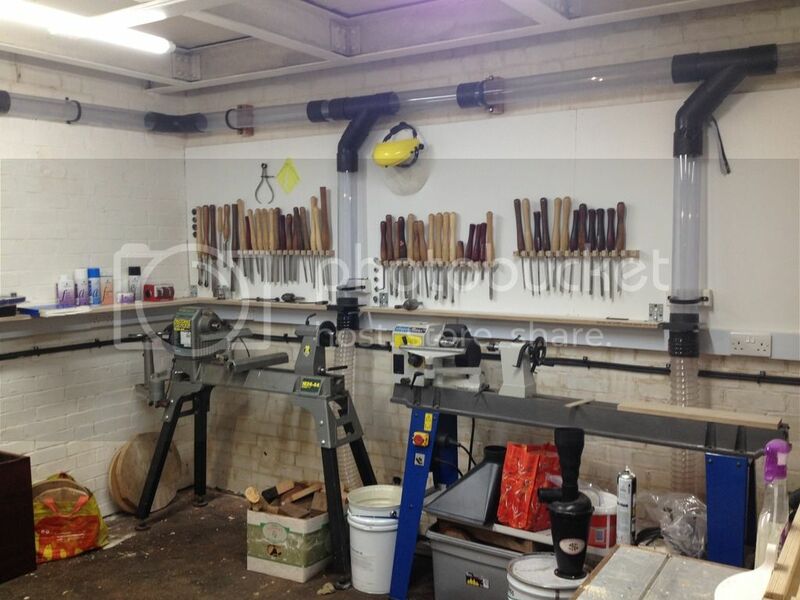 Press Drill, Mitre Saw, Lathe and band saw. We also plan to include a sanding box. To deal with the fine dust we have also purchased two Record Power AC400 three stage air filters. These will be fitted high in the ceiling area and can be remote controlled. they can also be timed to stay on for 2 hours after we leave so that they can finish drawing all the dust from the shed. Now the issue of fine dust will never be eliminated completely that is why we should not overlook the need and use of quality dust masks at all times. As I stated this is our current project. We have all the equipment, and have started to plan pipe routes etc. I shall update on how efficient our system works once its fully opperational. This reply was modified 2 months ago by bjnorris. Calne Men’s Shed have set up an impressive system, the ducting goes through a hole in the wall to the dust extractor housed in a store room next door. 110 is the common size for most drainage pipe lines and is a lot cheaper than 100mm the only issue and the reason that we are going to use 100mm is that we have not found a reasonable price for clear 100mm pipe. Clear is the preferred choice as it allows you to see the location of any blockage in the system should one occur.